Our CPR courses offered are listed below. Each course consists of a video/DVD presentation, instructor review for emphasis and hands-on practical skills with individual manikins. A student manual is included for new students. Certification is for two years. All classes listed below are taught on-location and in-house. Please contact us for further information. American Heart Association course must now include AED with CPR certification. 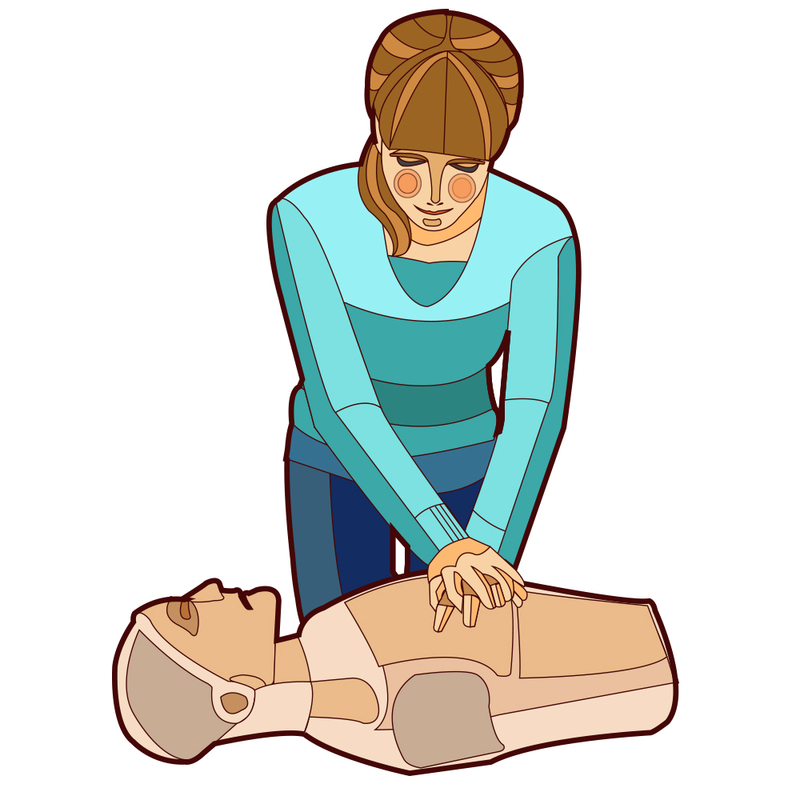 The above CPR classes are for anyone who wants to learn basic CPR including parents, caregivers, corporate and retail employees…..EVERYONE SHOULD BE TRAINED! 5. BLS for the Healthcare Providers (American Heart Association certification): This class is for anyone in or going into the healthcare profession including students, law enforcement, fire and EMS workers, doctors, nurses, massage therapists and dental offices. 6. AHA Instructor Courses: This class is recommended for anyone who would like to teach for their organization, corporation, church or school. A 2-part course, the first part completed at home accessing an online course. The second part will be hands-on instructions covering course components, administration of course, policies and more. Our First Aid class provides instruction in proper assessment and immediate treatment of approximately 20 of the most common medical emergencies. The course consists of a video/DVD presentation, instructor review for emphasis with hands-on assessment and treatment. Certification is for 2 years. 1. Basic First Aid: Recommended for employees in corporate and retail settings, security, and anyone needing a First Aid certification card. 2. Pediatric First Aid: Recommended for childcare workers, parents and anyone needing a Pediatric First Aid certification card. 3. Instructor Courses: This class is recommended for anyone who would like to teach for their organization, corporation, church or school. A 2-part course, the first part completed at home accessing an online course. The second part will be hands-on instructions covering course components, administration of course, policies and more. Heartsaver Bloodborne Pathogens Course is a classroom course that teaches employees how to protect themselves and others from being exposed to blood or other bodily fluids. This course is designed to meet Occupational Safety and Health Administration (OSHA) requirements for bloodborne pathogens training when paired with site-specific instruction. For individuals with a reasonable chance of coming into contact with bloodborne pathogens such as: correctional officers, childcare workers, security guards, maintenance workers, school personnel, hotel housekeepers, health and fitness club staff, tattoo artists, etc. Inoculations are administered on-site by CPRofessionals, Inc. We will maintain a record of employees inoculated including dates, lot numbers and vaccination type to ensure safety and timely boosters. Hepatitis A– Recommended for any employees traveling abroad. Hepatitis B– Recommended for any employees exposed to international personnel or bodily fluids. Tuberculin Purified Protein (PPD)– Tuberculosis test given yearly to those in the healthcare field or administering First Aid. Flu– Recommended for any employees interested in protecting themselves against the yearly flu. *The above is based on availability of serums and advanced scheduling of medical personnel. Please feel free to contact us with any questions you may have. What course should you take? Are you a healthcare provider? If you are a doctor, nurse, dentist, etc, you will need the BLS for Healthcare Provider course. Are you a firefighter or first responder? You will need the BLS for Healthcare Provider course. Are you a massage therapist? Check with your employer or school, but most likely you will need the BLS for Healthcare Provider course. Are you a coach? Check with your school, but you will most likely need the Heartsaver First Aid with CPR/AED course. Are you a parent? Choose the Heartsaver CPR/AED course or the Heartsaver First Aid with CPR/AED course. Our staff was highly impressed with the excellent presentation. The best I have witnessed in my educational career! Loved the class, very enlightening. Will recommend to any who need the training course. Loved it!!!! Donnie Hughes, Cycle Chem Inc.